Hover over the Analytics tab, then hover over the Real-Time Stats flyout. Click on Real-Time Alerts. The list of existing alert configurations (if any) is displayed. 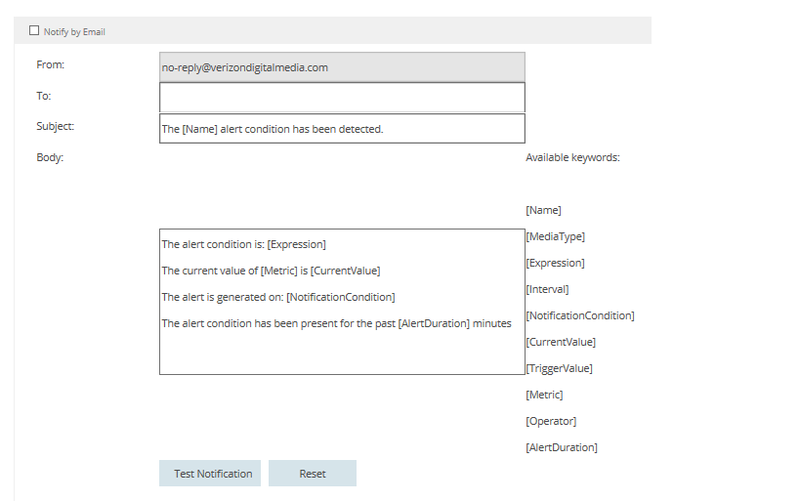 A form for creating a new alert is displayed. If you want this alert to be active when you click Save, check the Alert Enabled checkbox. Enter a descriptive name for your alert in the Name field. In the Media Type dropdown, select HTTP Large Object. You must select HTTP Large Object as the Media Type. 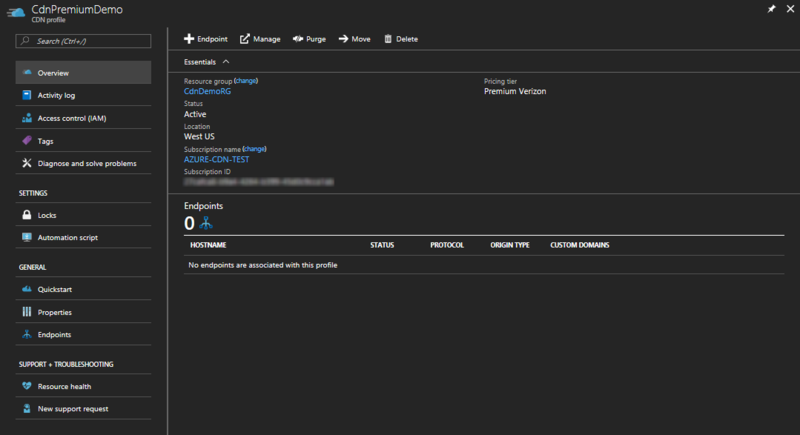 The other choices are not used by Azure CDN from Verizon. Failure to select HTTP Large Object causes your alert to never be triggered. Create an Expression to monitor by selecting a Metric, Operator, and Trigger value. Operator is the mathematical operator that establishes the relationship between the metric and the trigger value. Trigger Value is the threshold value that must be met before a notification is sent. In the following example, the created expression indicates that a notification is sent when the number of 404 status codes is greater than 25. For Interval, enter how frequently you would like the expression evaluated. In the Notify on dropdown, select when you would like to be notified when the expression is true. Condition Start indicates that a notification is sent when the specified condition is first detected. Condition End indicates that a notification is sent when the specified condition is no longer detected. This notification can only be triggered after our network monitoring system detected that the specified condition occurred. Continuous indicates that a notification is sent each time that the network monitoring system detects the specified condition. Keep in mind that the network monitoring system checks only once per interval for the specified condition. Condition Start and End indicates that a notification is sent the first time that the specified condition is detected and once again when the condition is no longer detected. If you want to receive notifications by email, check the Notify by Email checkbox. In the To field, enter the email address you where you want notifications sent. 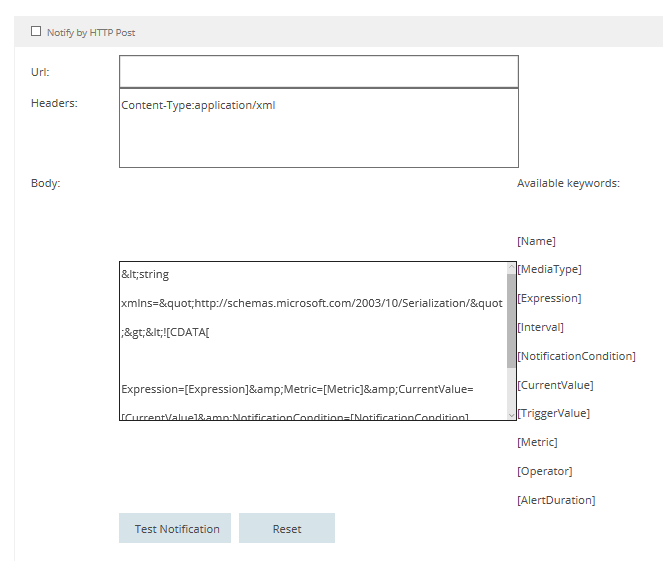 For Subject and Body, you may leave the default, or you may customize the message using the Available keywords list to dynamically insert alert data when the message is sent. You can test the email notification by clicking the Test Notification button, but only after the alert configuration has been saved. If you want notifications to be posted to a web server, check the Notify by HTTP Post checkbox. You can test the HTTP Post notification by clicking the Test Notification button, but only after the alert configuration has been saved. Click the Save button to save your alert configuration. If you checked Alert Enabled in step 5, your alert is now active.